I had a cabbage left from my Bountiful Basket and wanted to use it before I get my new basket this weekend. The typical mayonnaisey (that’s a word, right?!) coleslaw didn’t sound appealing so I went on the hunt for a different preparation. 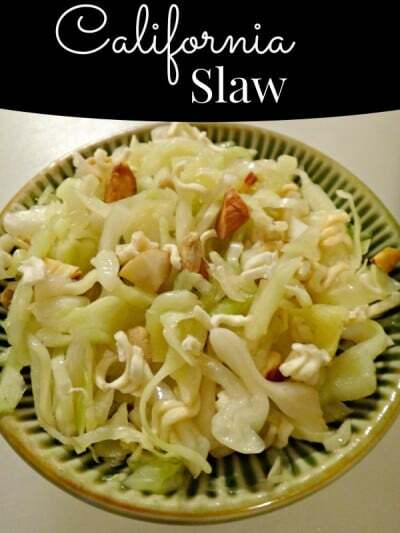 My recipe box coughed up this golden oldie – California Slaw. I’ve had this recipe for a looong time, but haven’t made it in years. I’m not sure why or how it was moved to “forgotten” status because it’s still as good as I remembered and a nice change from the traditional coleslaw. While not the most photogenic dish (especially at the end of the day – ha! ), I guarantee California Slaw tastes better than it looks. The dressing is a nice blend of tangy, sweet and a little salty from the soy sauce – yum!! Paired with the crunchy cabbage, almonds, sunflower seeds and Ramen noodles makes this a winner all the way around. Prep time is fairly minimal – you can easily make this on a weeknight. Toast the sunflower seeds, almonds and Ramen noodles in a skillet until lightly browned (watch carefully they burn quickly). Using a large bowl, combine the shredded cabbage and scallions. Set aside. Dressing: combine the vinegar, sugar and soy sauce; stir to combine. Slowly add the oil, whisking until emulsified (can use an immersion blender). When ready to serve, add the toasted sunflower seeds, almonds and Ramen noodles to the cabbage and onion mix and stir. Pour the dressing over the slaw and stir until well coated. Toast the sunflower seeds, almonds and Ramen noodles in a skillet until lightly browned (watch carefully - they burn quickly). This looks amazing! Pinned. Please come and party with us tonight at 7 pm. It just wouldn’t be a party without you! 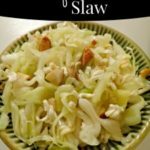 I just love the crunch in this California Slaw, it looks so good. Thanks so much for sharing with Full Plate Thursday and have a great weekend!